Our bodies are often overlooked as a way to connect to energy. We tend to disassociate from our bodies, wanting to escape from or change them. Yet our bodies are exactly where we should look first for connection! This is where we live and it is here we can most easily connect to our own energy. In this life, our energy is merged with our physical body, so we can most easily work with it through the body. We tend to rush around, either trying to get to the next thing or thinking about something that already happened. We look for things outside of ourselves to make us happy or to give us the answers. All of this seeking and effort takes us out of the present. It tenses our bodies, squeezing our energy into tight bundles, rather than allowing an open flow. Of course, we have to plan and think in order to function in the world. But we also have to learn how to bring balance back to ourselves, to come back into our bodies and into the present. Finding this grounded presence within our body can help us to more readily process emotional energy. It puts us back in touch with our breath and with the world around us. By returning to this state regularly, our energy channels stay more open, we have less pain and solutions come more quickly. And though it may seem counterintuitive in the beginning, by coming home to yourself often you very quickly begin to feel the connection you have to all others and to the larger energy that contains us all. An added benefit of regularly grounding in this way is that you will have more energy and will be less likely to be drained from doing Reiki treatments. So on a practical level, how do we do that? How do we find grounded embodiment and present moment awareness in modern life? And how do we find balance and openness within our bodies? While there is no magical formula that will work for each individual, there are a few things that you can do on a regular basis that you will probably find helpful. Choose any or all of these practices. Once you find the ones that help you, make them permanent practices in your life. Place one hand over your heart and the other over your solar plexus. Just feel your breath moving for a few cycles. If you like, you can expand by recalling a time when you felt pure love or when you felt very happy and free. Let that feeling wash over your entire body. Stop whatever you are doing for a moment and close your eyes. Let your attention scan over your body for a minute or so, checking in with the muscles and your breath. Don’t judge, just check in, like you are visiting a good friend. Be still for a moment and allow your awareness to float down into your body as far as you can. If it feels stuck somewhere on the way down, send love to that area and ask it to open, allow and expand. As you do this, you will probably notice that you feel heavier in your lower body and that tension in your upper body relaxes somewhat. Take regular sea salt baths, or Espom salt baths. They are very cleansing for the energy and very grounding, as well. Take moments here and there during your day to pause and focus your attention on something in your physical environment. This will both ground you and return you to the present moment. Try doing an activity while keeping body awareness or breath awareness. This may be easiest to practice while going for a walk, doing your exercise or dancing. It can be done while doing anything, from chopping vegetables to riding on a bus. Be patient with yourself. In the beginning, you may find it difficult to be present in your body for more than a second or two, or to feel the presence at all. Also keep in mind that some days will be more challenging, even if it is normally pretty easy for you. It tends to be tricky when you are very ill or extremely busy. Keep returning to the practice and you will begin to see the changes. 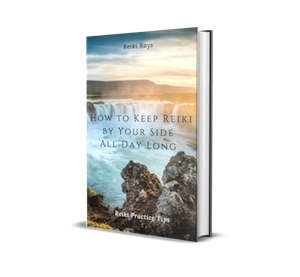 Previous post: How Simple is your Reiki Practice?